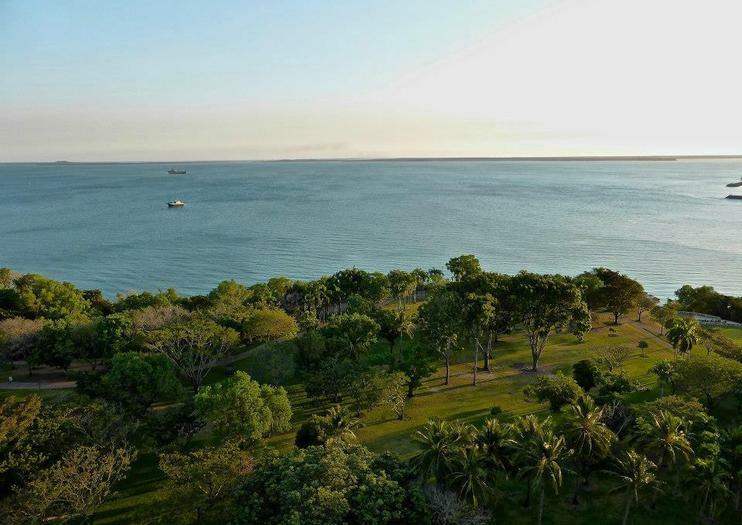 This expansive park runs the length of Darwin’s waterfront, looking down onto the Darwin Harbor and Lameroo Beach. It stretches south from the Northern Territory Parliament House down to the Doctor’s Gully area. It is a large outdoor space popular for holding local festivals, including May Day and the Darwin Festival, as well as many weddings. It is a great place to simply take a stroll and enjoy the scenery in Darwin, with paths often shaded by tall tropical trees. The park is also home to several war memorials, including the Cenotaph War Memorial, the Civilian Memorial, and the The USS Peary Memorial (which sunk in the Darwin Harbor.) Memorial plaques commemorate the stories of those who have served their country, both Australians who lost their lives in the Bombing of Darwin and Aboriginal men and women who helped defend the Northern Territory coastline. See the highlights of Darwin on an afternoon coach tour with informative commentary. Your tour takes in Stokes Hill and Fort Hill Wharf, St. Mary's Cathedral, Government House and Parliament House, Mindil Beach and includes visits to Museum and Art Gallery of the Northern Territory and Darwin Botanical Gardens. This cosmopolitan and multicultural city is known for its markets and festivals, along with a relaxed pace. Hear about the effects of the devastating 1974 Cyclone Tracy and more during this comprehensive introduction to Darwin. Set sail around Darwin Harbour for a scenic 45-minute sightseeing cruise and enjoy serene views of the Northern Territory capital. Hop on board a comfortable catamaran and listen to the live on-board commentary as you float along Lameroo Beach, glide around Stokes Hill Wharf and spot waterside landmarks like Bicentennial Park, the Larakeyah Barracks and the sunken USS Peary.